Esi Product Line — Energy Sciences, Inc. The world leader in electron beam technology, Energy Sciences Inc. (ESI), understands that one size does not fit all, especially when it comes to EB products and machines. That's why ESI has a full line of EB options to fit your budget, needs, and industry. For all of your CI Flexo line needs, ESI has the FlexoBeam, which offers the lowest cost EB in today's market. 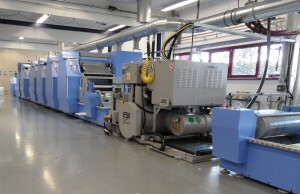 For Web Offset lines, ESI has many different EZ Cure machines to match your needs. The EZ Cure-CR was designed for high speed eBeam for thin, extensible webs. The EZ Cure-LP has the lowest total cost for high speed Web Offset. When space is an issue, there's the EZ Cure-DF, which is the most compact in-line EB for today's high speed Web Offset lines. The Electrocure product line ranges in operating voltage from 150 kV to 300 kV. You can chose from an existing design or ESI can custom design a system to meet your specific requirements. We will work with you to deliver the most cost effective electron beam solution for your needs, and guarantee performance. If you have a printing process or application, then you need electron beam from ESI. To browse the full product line, please visit this link.